Restaurant Campo Del Drago Restaurant, the main restaurant of the property, express the equilibrium of italian and tuscan cuisine withe deep-rooted flavours and strong identification with creative inserts suggested by the chef. The village reveals to the visitor traces of Etruscan civilization and artistic production from the Middle Ages and the beggining of the Renaissance. It is believed to be among the most preserved ancient Tuscan properties, placed in a overhead position and it is remembered by his strategic role since Etruscan period in 600 a.C. and as a resting palce along the Francigena Way. Infact, the ancient Pieve of San Michele offered hospitality to the pilgrims in trip from Canterbury to Rome, around the year 725 d.C. The Castle dates back to the Middle Ages and in his ruins conserves artistics finds. In San Michele Arcangelo Pieve it is possible to admire Saints Annunciation fresco by Pietro Lorenzetti dated back to 1345 and restored after the 1876. The Description The Borgo is placed to the border of Val d’Orcia, 90 km from Florence and 45 km from Siena. It is inland of an estate of 2000 hectares and restored following the Made in Italy style. The restoration has included ten buildings of 5 stars quality, for an amount of 23 suites and 10 villas, an old cellar, the “fumoir”, the ex-stables, the Church and the Rectory. We can find also areas for the culinary offering: the tavern, inside the bar and at the Restaurant. Health itinerary are proposed in the external area of the estate which commends 4.500 acres in bloom, orchards, a Sangiovese vineyard, olive groves and a vegetable garden. There is also for the guests a wellness area, a fitness center and a tennis court. A panoramic swimming pool offers a spectacular view in the country and the Golf Club it is composed by 18 holes. Description Borgo’s rooms are divided between the central body and the neightboring independent cottages. They are elegant for the style, which reflects the colors of the country, and prepare to the quiet and relax. Some of them have a borgo alleys view and others have a country panoramas. Rooms are divided in different types and have matrimonial bedrooms, big bathroom, LCD TV, free Wi-fi access with high speed, iPod station, Nespresso machine, free minibar with biscuits and snacks home made, meanwhile alcoholic beverages are excluded.The suites offer Simmons mattress, C&C Milano sheets, LCD TV, wi-fi, newspaper. Description The capacity changes from 50 mq about of the Special Room and from 60/80 mq of the Junior Suite, both placed in the central part of the Borgo, to 78/101 mq of the Terrace Suite, placed inside the old cellar and Borgo’s stables, these latest characterized by wide terraces covered with pergolas and with a direct access to the ground floor. Description CdB Suites (11/137 mq) are disposed outside the central part, near the different buildings which compose Borgo. They are characterized by artworks realized by florentine craftsmen. Some of the Suites are equipped of an extra bathroom for the guests, private terrace, meanwhile Villa Suite (137 mq) —, placed near the small Villa separated from Borgo, offers a private entrance, a terrace and a big private garden with a wood oven. The Description The 10 Villas are independent residences for families or private groups and corporate, which live in a contest of climbing terrace, laws, aromatic herb, exclusive swimming pools with heated water. They born with the philosophy of extreme privacy and the refined bedrooms are are equipped of extra places and comfort like: kitchen with modern equipments, dining room, living rooms with antique furnitures, multimedia rooms, Internet Wi-Fi connection high speed, gardens with wood oven, wide pool houses, private tennis courts, private chef and waiter service. The guests can use private transfers with car or helicopter (there is an heliport inside) and bodyguard. The Description Wine and food offering iis composed by the main Restaurant, by the Osteria, proceeds from the ancient Canonica del Borgo, inside of the workshop, where buy local delicacy and all producets of the Borgo, in addition to tuscan wines, in a vegetable garden with 180 variety of vegetables and aromatic herbs, on hand to the guests, by the panoramic Bar in the Siena clay and in closing by the important Cellar. Description The seasonal tastes of Italian and Tuscan cooking exalt the senses of the territory, with creative loan words suggested by the chef. Dishes are inspired to Brunello di Montalcino, paired with Borgo's wines, or with famous regional and international labels. Locations are elegants, with an opening during the evening, so appropriates for important dinners, or private events and corporates, which find the best expression in the outer terrace exposed to the hill and to the area of Val d’Orcia. Description Near the Restaurant, in the heart of Borgo, we can find a place more rustic, obtained by the antica Canonica. All around there are wood, wrought iron, wood oven for a selected proposal of pizzas, and fresh vegetables are proposed always. It’s a tuscany tavern opened all day, characterized by an informal atmosphere but sophisticated, with tables setter for lunch or for an informal dinner, also theme for example like alternative proposal and which precede the business gala of the next evening. The Description. 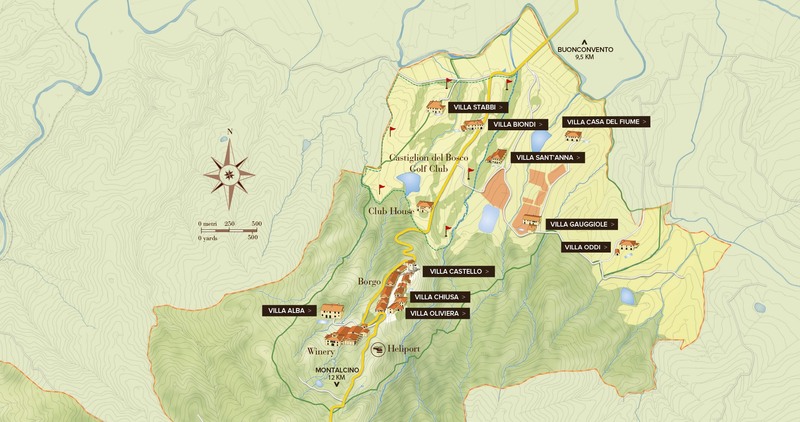 An historical company, with a cellar of 4.000 mq and with is particular barrique is the fifth producer of Brunello on 51 of the over 60 hectares of the vineyard. It practices the double selection hand made as the 18th century. The company produced also Grappa, Oil and Honey, for which it is ables to organized visits and professional tasting articulated on different products of high quality, various and interesting. 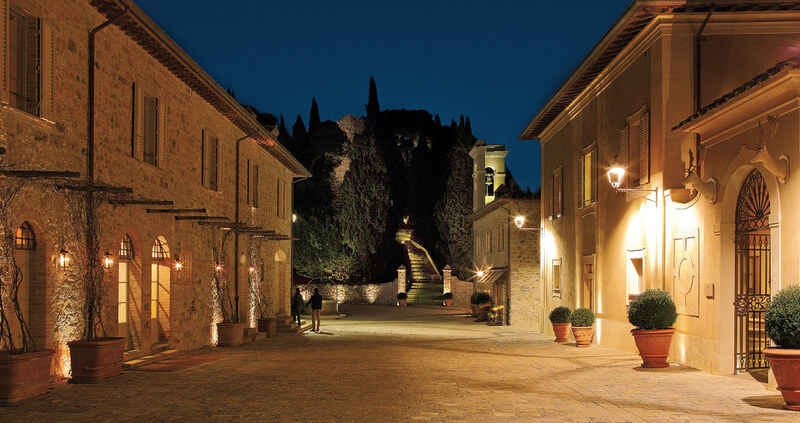 The Areas The Borgo is the perfect location for meeting and events of high profile, which can occur in the central body of the Borgo or in one of the Villas, in a contest more reserved and exclusive, equipped of technological frames and Wi-Fi. Rooms, with capacity from 8 to 100 people, can be used for meeting, focus group, brain-storming, sessions, launch of a product, a private meeting of affairs, a company retreat of high level. Privacy, discretion, familiarity and at the same time elegance of the contest, convey the areas appropriate for particular moments like a special celebration,parties, galas, emotional events. The Athletic Activities The leisure stays and corporate events are supported by a combination of activities which can carry out among the Borgo. From the sport point of view guests have at disposition Golf with 18 holes, Technogym gym, wellness centre, tennis courts, yoga, pilates, infinity pool, excursions, mountain bike, boot camp, archery, itinerary on foot in property’s garden. The Borgo is the start point to explore the surroundings on horse, with bike following the hill streets or with an hot-air balloon. Deers, boars, pheasants, badgers, which are inside of the wild reserve, promote the rediscover of the nature, wellness and for itself. Description At the Borgo are organized courses near the Cooking School, oil and wine tasting, picnic in the vineyard. The strong point of the building are the professional guide visits to the cellar of 400 mq and to the Barricaia, combine with Brunello tasting or with a grape harvest experience in the end of september during a visit to the vineyards. Under the artistic, cultural and personal profile, we can suggest to the guest the development of the activities through a guide itinerary with the astronomer, the counselor and the coach, the photograph, the artist, the wine and food turist guide. All experts help to discover Borgo under another point of view, making attention to the eight hundred of the Borgo's history and reconnecting the external areas to an experience of wellness and personal growth. The Golf Course and the Club House A particular mention is dedicated to the Green 18 holes, planned by the legendary Tom Weiskopfal, who praises the hole most longer of Europe (620 m). The area it’s perfectly equipped for the exercises and provided with sand for bunker approved by the European Tour, expressly imported by Germany. The ancient community house of the estate has been restored following a modern design which respected the rural and originally tuscan architecture. The building host the Club House, which follows the rule of a limited and selected access to the Club, with the purpose to follow the same philosophy of exclusivity, privacy, discretion in which it is based the Borgo.